Two words: Zucchini Blossoms. 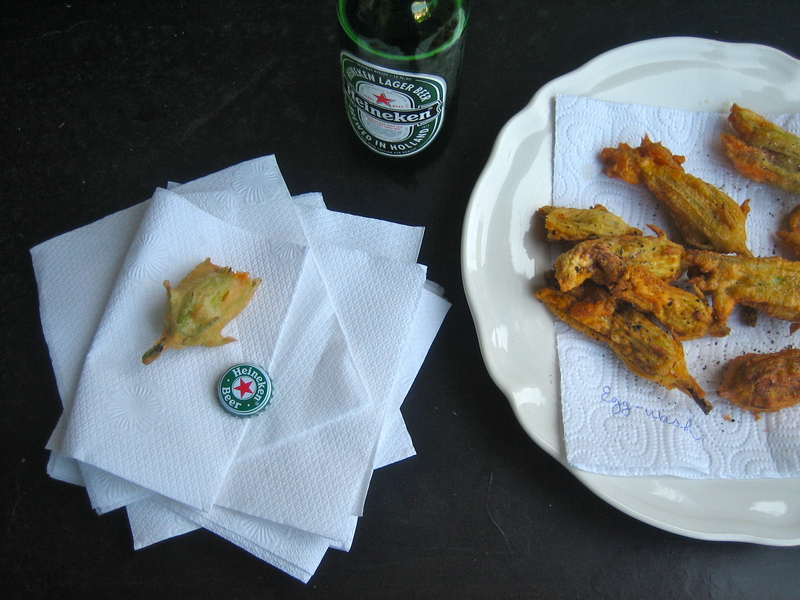 Ok, make it three: Fried Zucchini Blossoms. It started at my neighborhood farmer’s market. It was Sunday, and I was walking around, picking up zucchini, and cucumbers and warm, heavy tomatoes, when out of the corner of my eye, I saw two little boxes of zucchini blossoms tucked away behind a cash register. Pale green, with fiery orange insides waiting to unfurl, all golden and ablaze with summer. I bought a box, and was surprised at the cost ($4 a dozen); I was expecting it to be exorbitant; they seemed so fragile and ephemeral. The sun was beating down hard, and the little plums on the neighboring stand were melting into each other, bruised and bleeding in the heat. It felt like these delicate blossoms must have but a fleeting moment before they were to wilt and shrivel. Afterwards, I stepped into a nearby cafe for brunch, and as I sat down, the hostess noticed the box peeping out of my bag and exclaimed rather loudly: “zucchini blossoms”! We launched into a discussion, and I told her that I had never tasted them before, and that I was thinking of stuffing them with some sort of cheese mixture, and then pan-frying them. She presented a good argument for deep-frying them, plain, in a simple batter, to fully savor their unique taste, reminiscing about a summer spent in Italy. I’m easily convinced. 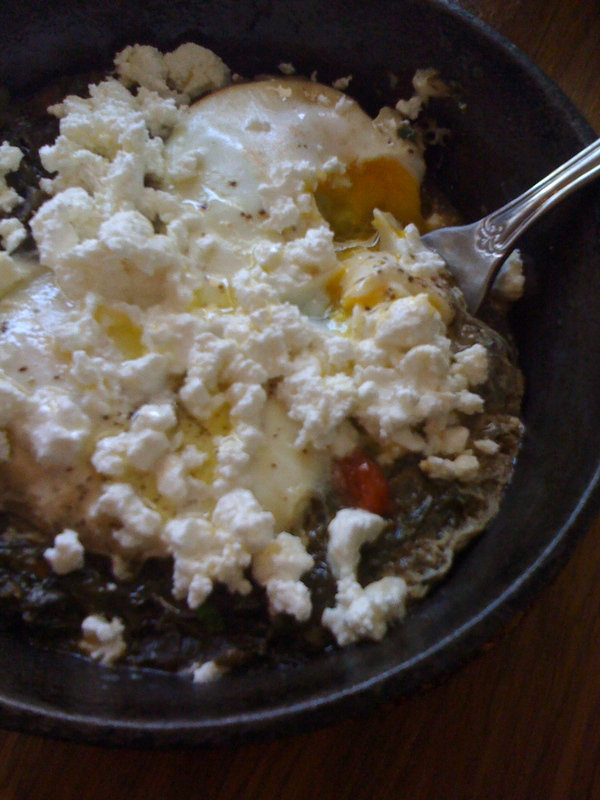 Top: Green Shakshuka with braised swiss chard at Mimi’s Hummus. 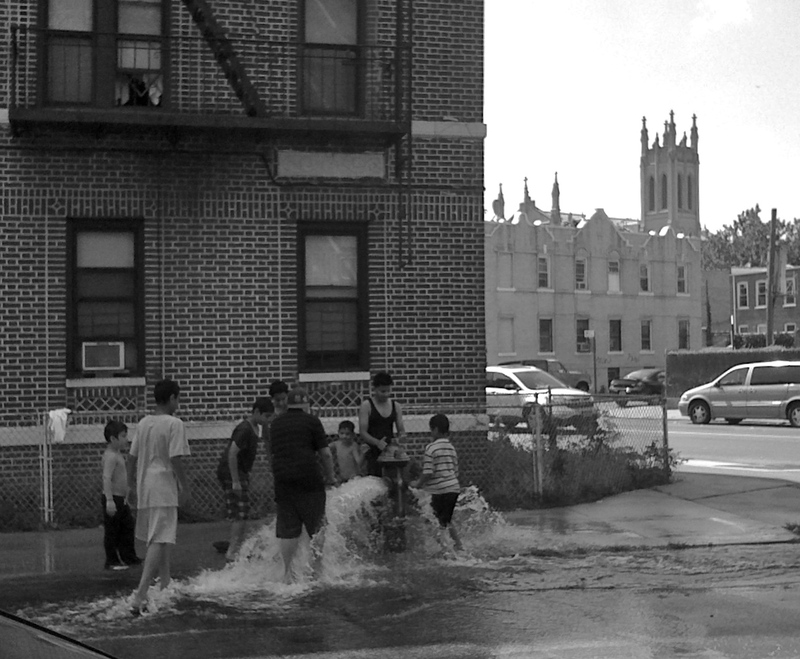 Bottom: Brooklyn in Summer. 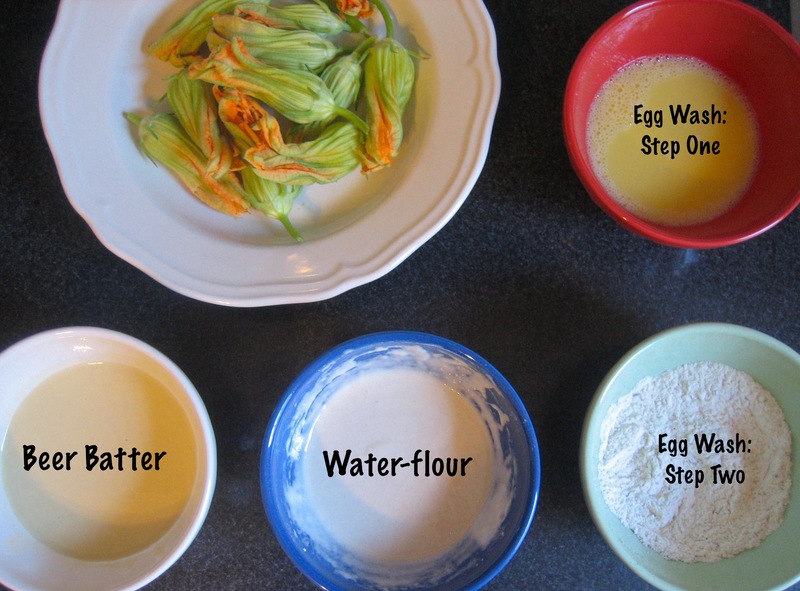 Back home, I googled different recipes for fried zucchini blossoms, and narrowed it down to three options: a beer batter, a water-flour mixture, and an egg wash. I decided to put my indecisiveness to use for the greater good, and decided to make all three types to compare. Let’s cut to the chase: The water-flour mixture? The one I had the least of hopes for? It was phenomenal. While the other batches turned soggy quickly, and were a tad heavy, with the taste of the beer/egg interfering with the blossom’s floral notes, the water-flour batch emerged with a thin crust, almost like a lacquer, shattering a little upon the bite, crackly and hard; the perfect contrast to the blossom’s soft, almost-cottony insides. Spectacular. 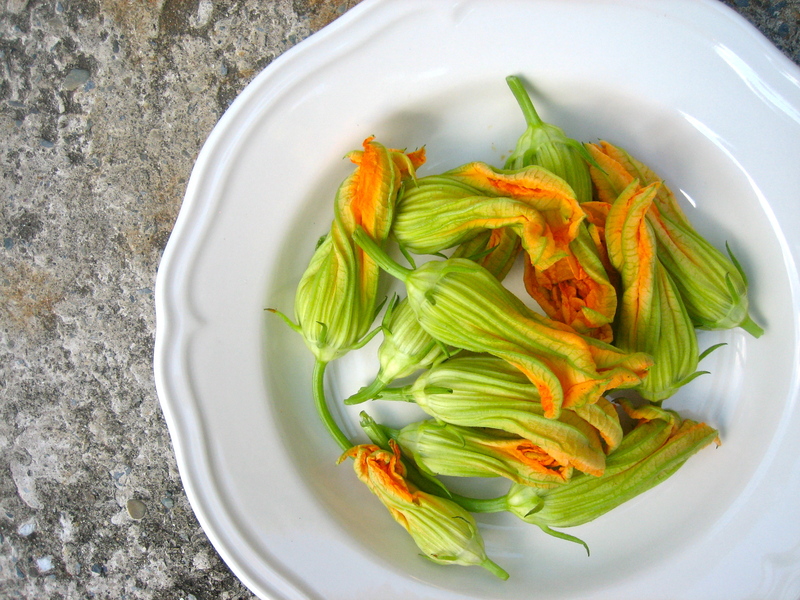 If you spot zucchini blossoms in your area, please don’t hesitate! Back home, mix together flour and water, deep fry them, and voila, within less than ten minutes, and with such minimal work it’s almost laughable, you have a bite that’s heavenly, glorious, and a fleeting moment of summer. Celebrate with a cold beer. Fill a large, heavy pot with an inch or two of oil, and place over medium-high heat. Meanwhile, mix the flour and water with a fork until it resembles sour cream. To check if the oil is ready, drop a tiny bit of the batter into the oil, if it rises to the surface and sizzles quickly, it’s ready. Dip the blossoms one at a time in the batter, shaking out excess, before dropping them into the hot oil. Fry for about two minutes on each side, or until golden. Remove to a plate lined with paper towels, and sprinkle with salt and pepper. Serve immediately, preferably outdoors. Not onboard with deep-frying? Find inspiration here. if it’s not too late i will def try that. The comparison of the three methods was helpful! Thanks for a great post. Hello! 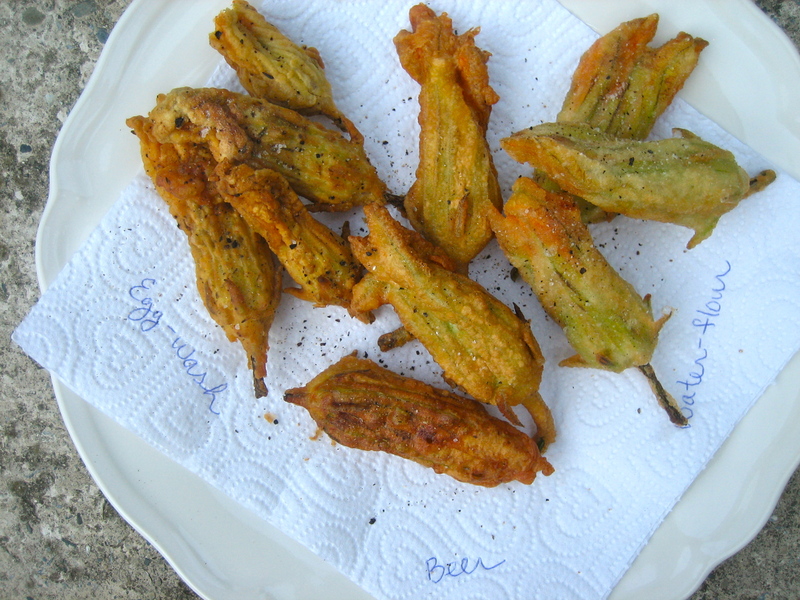 I’m reading Marlena de Blasi’s “A Thousand Days in Tuscany” and they introduce fried zucchini blossoms. I had no idea how they looked like and googled them – landing on your blog! I am writing a piece on blossoms but since I dont think I can find them in the market, I’m referring readers to your very beautifully detailed post! !